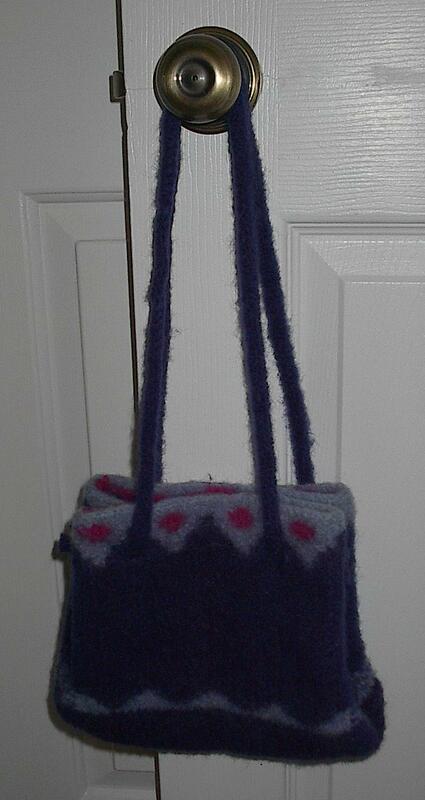 Measurements: Felted, 8 inches/17.5 centimeters high, 6 inches/13 centimeters wide, and 3 inches/6.5 centimeters deep. Materials: Brown Sheep Nature Spun Sport, 100% wool, 184 yards/168 meters, held double. 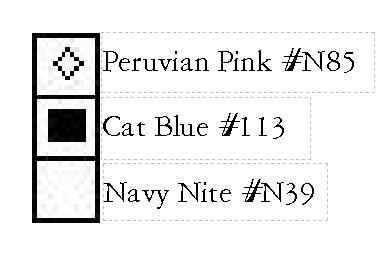 3 balls Navy Nite #N39, approx 1/2 ball Cat Blue #113, and approx 40 yards/36 meters Peruvian Pink #N85. Size 10 1/2 US/6.3 mm circular and double points. Gauge: about 3 1/2 stitches per inch/14 sts per 10 cm, unfelted. 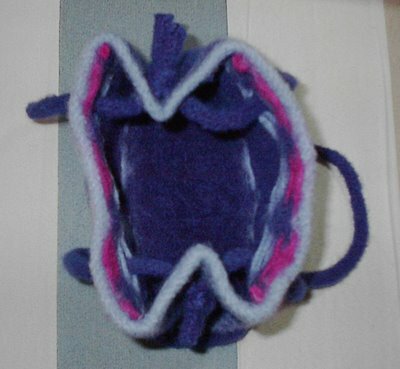 About 5 stitches per inch/20 sts per 10 cm, felted. 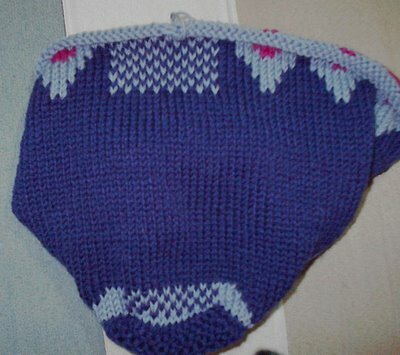 Directions: For bottom of bag, USING THREE STRANDS OF NAVY, cast on 15 stitches and knit 42 ridges of garter stitch. Reduce to two strands of Navy, pick up 42 stitches along long side of rectangle, 15 stitches on short side, 42 on other long side, and 15 stitches on last, short side, for 114 stitches total. Begin following chart for long sides of bag. 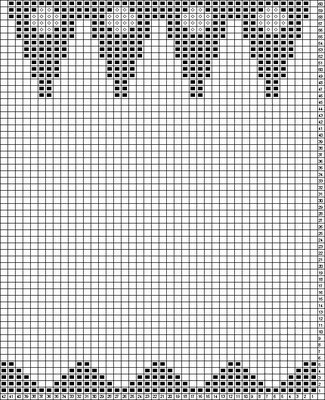 When you reach the pink spots in the chart, simply carry the three colors of yarns as needed and cut the pink yarn at the end of each long side of the bag; it will be felted later, so neatness on the inside is not vital. (Alternately, if carrying three strands of color bothers you, you can duplicate-stitch them in after knitting but before the felting process.) 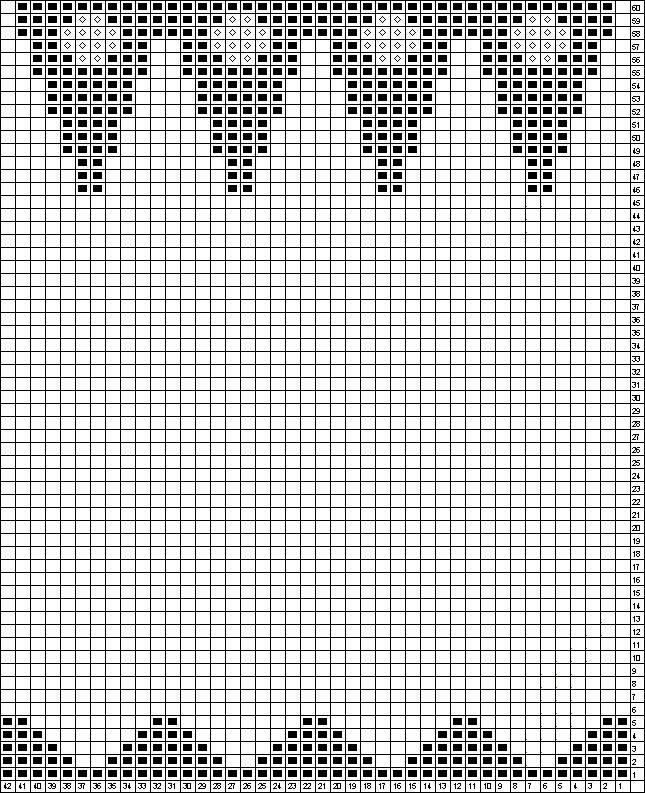 When finished with the chart, knit a last row with Cat Blue and then bind off. Knit approximately six feet of four-stitch I-cord in Navy Nite. While the bag was wet I cut holes through all four layers near the top and shoved size 15 US/9.95 mm knitting needles through the holes as it dried. I pushed the ends of the I-cord from the front of the bag, through two layers to the center of the M fold, and knotted it with the one coming in from the other side. And there you have it. A Deco-ish bag.